I hope all is well. I think I speak for everyone when I say, the North Pole can keep their vortex. I want to thank everyone for their commitment in such extreme weather conditions. Surprisingly, the new trucks all started in the sub-zero temperatures. We had some plants closed and loads canceled, but all in all, we survived it. Nothing says welcome to Michigan like a one-day sixty degree temperature change. I'm looking forward to spring. As far as I'm concerned, it can't come too soon. The company and extra-lease have started the trailer swap process up again. They are pulling the old trailers out of service and putting the new trailers into the system. This process will continue until some time mid-spring. There seems to be some issues with a few GMCCA plants keeping loaded trailers past their expiration date, and then refusing to unload it. We have no control over this and are letting XPO and GMCCA work out that problem. All we need to be concerned about, as drivers, is try not to take an outdated trailer somewhere to get loaded. The plants will not let you into their facility with an expired trailer. I would like to congratulate one of our Flint drivers, Jim Clark, on being selected to serve on the American Trucking Association's (ATA) 2019-2020 America's Road Team. Jim was among hundreds of nominees from all over the country, and is one of only 18 drivers selected. This is a great honor and speaks to the caliber of drivers that we have here at ACC. Jim, I know you will do us proud. The Bargaining Committee is still collecting surveys. We have received quite a few and I thank you for that. It's never too late to turn yours in. We would like your input on what we're looking for in our new agreement. At the time of this report, the company and your Bargaining Committee have not started any talks. However, on our side, we have started preparing for the negotiations. I will keep you, the membership, updated on any news about the negotiations. I would like to thank President Steve Gruener and our Local Executive Board for giving me the opportunity a few weeks ago to go to the IPS, TOP and Gaming conference. It was a great experience. I had a chance to meet with other union leaders in the transportation field. We held an election of officers for the trucking sector and I raised my hand and was elected President. I'm hoping to use this platform to bring awareness to our issues of trying to retain work and save good union jobs. There were classes held during the conference that I attended in which I learned about costing and sourcing, tools that should be beneficial to us during the upcoming negotiations. I also heard about the economic injustices going on in the world, the impact that electric vehicles will have on the auto and transportation industry, and how to deal with violence in the workplace. It was a great conference and I came back with the knowledge and tools that will help me represent you better. In closing, I wish you all well, and remember... always be safe out there. I hope all is well. With a new year upon us, I'm looking forward to a better year ahead. It's been a mild winter so far, and I hope it holds out. Sorry to those members who like to snowmobile, ski and ice fish. Personally, I would rather have the mild weather anytime. As most of you know, our CBA expires April 30, 2019. With that date approaching quickly, your Bargaining Committee is preparing for the upcoming negotiations. We anticipate starting sometime between 60 and 90 days prior to the expiration date. Your Bargaining Committee cares about your input into the negotiations. I have prepared a survey for our membership to fill out. We want to know what you want to see in the new contract, and what you want us to bargain for on your behalf. We're asking for your top five suggestions. These surveys must remain confidential and shouldn't be seen by management. We ask that you please fill one out and turn it in. You can slip it under the Union Office door in Flint, or hand it to one of your Bargaining Committee members personally. When we start talks, it will be very important to keep the rumors down to a minimum. Your Bargaining Committee will be keeping you updated on the status of the ongoing negotiations. If you haven't heard it from one of us, chances are it's a rumor. We need to show the company that we are all together in solidarity. 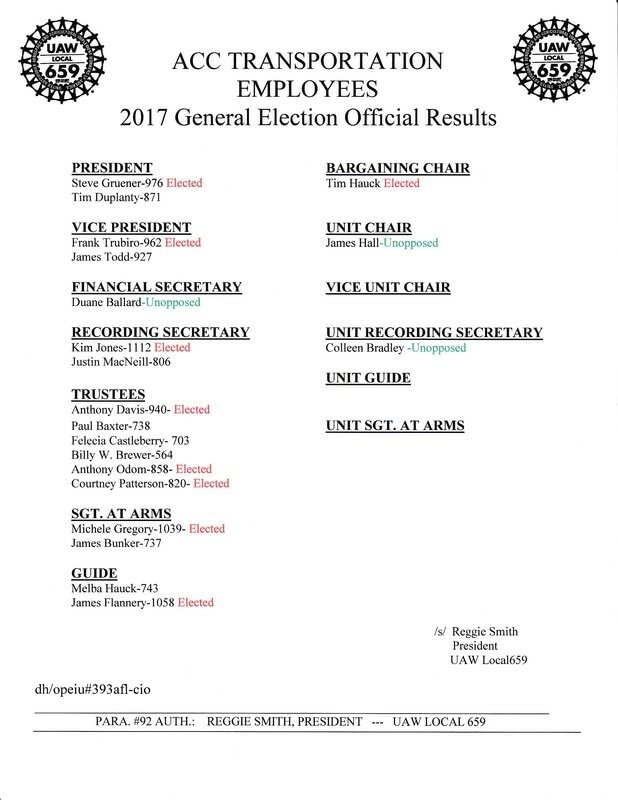 Unit Chairman Jim Hall will be setting a time, date, and place for an election for Unit Vice Chairman and Recording Secretary soon. Look for postings in your location. Sign up and please get involved in your Union. You can make a difference if you try. White Shirt Day, honoring the brave workers of the Sit-Down Strike, is February 11, 2019. We at Local 659 will be hosting the celebration this year. The drawing for the Region 1D V-CAP vehicle will take place during the celebration. The Union Sportsman Alliance Conservation Dinner will be held on February 21, 2019 at our Union Hall. For event details, see the notice on page 8 of this Searchlight. Also, there is a flyer in the driver's room. In closing, I wish you all well, and remember... always be safe out there! I hope all is well. I want to start out by wishing all of you and your family a very Merry Christmas and a Happy New Year. Try not to lose sight of what's important this Holiday Season, quality time with family and friends. Retailers want us to think it's all about shopping and buying gifts. That should never be the reason for the Holiday. It should always be about time spent with family. I'm fully aware there's been an ongoing problem at Plant #77. Too many trailers in-bound and not enough going out-bound. It seems like they're using every inch of yard space they have to park trailers in. That makes our job very difficult at times. It also seems to be getting worse. Anthony and I have spoken to their traffic department about the problem. They've said they are working on a plan to help alleviate the congestion; possibly redirecting loads, or moving the rack loads to other off sites, at least until they get caught up. In the meantime, be patient while they work on it. Make sure to be extra careful while you're in their facility. When bringing a trailer in, don't try to put it in a spot that you're not comfortable with. Also, if you find that your out-bound trailer is buried two or three deep, get a switcher to help you. Under no circumstances move another carrier's trailer to get yours out. If you are having trouble with a switcher moving something for you, remember they're probably frustrated too. Don't argue with them, just call our dispatch and they'll handle it. We have lost a few drivers through retirement and resigning. The reason I bring this up is the company is looking to hire around four or five drivers in the coming weeks. If you know of someone who is interested, have them apply at GoPenske.com Make sure they put your name down as a referral, and you can receive the referral bonus. The only requirement is that they do have to stay with us at least six months. The annual Local 659 Red Wings bus trip will be on Sunday, February 17, 2019, at 6:00 pm. Bus will leave the Hall at 4:00 pm sharp. Tickets are still available. Come join us for a great time. The Local is selling 2019 Union Sportsman Alliance calendars. It features a two guns a week sweepstakes. I have a limited amount available at $25.00 each. Come see me if you're interested. I've been asked by our Unit Chairman, Jim Hall, to mention there are two openings in our Unit Executive Board. They are Unit Vice-Chairman and Recording Secretary. Look for election postings in early January. You are the Union, sign up and get involved. In closing, I wish you well, and remember ... always stay safe out there! Hope all is well, and everyone had a safe and wonderful Thanksgiving. Having turkey, watching football, and visiting with family are the best part of the holiday. With Christmas just around the corner, keep in mind there's going to be a lot of extra traffic on the roads. Most holiday shoppers will have things on their minds, other than driving. We need to help them arrive to their destinations safely, too. Pay extra attention, especially around shopping centers. Just don't assume the other driver sees you. Now that it seems cold weather is here to stay, make sure you bundle up and stay warm. Take extra time driving on slippery roads and watch your step in parking lots and on sidewalks. Well, the cameras have been installed in the trucks, and unfortunately, it looks like they're here to stay, for now. UAW International Servicing Rep. Scott Henry and I had meetings with management and Penske safety. We discussed the reason they were installed and the intent of their use. We had them put down in writing what they were going to use them for. They are still claiming it's for "coaching purposes only." I explained to them the disapproval and possible anxiety the cameras will have on the drivers. I told them that even if the camera isn't recording us all the time, it still feels like we're being watched. They didn't seem to care. They felt that "safety coaching" outweighed driver anxiety and disapproval. Scott Henry and I are having UAW legal department look into a possible grievance to disable the inward facing camera. In the meantime, we do have language in our CBA that protects us from the company using the video as sole evidence for disciplinary actions. On the other side of that, there is also language in the CBA (Art. 21, Sec. 7) that says "Tampering with safety-related equipment or devices" is an offence for which an employee may be subject to discharge for the first offense. My point is, even though we don't like the cameras or don't agree with the company's decision to install them, we cannot tamper with them. That includes putting something over the lens, and putting something in front of it to block its view. As most of the GMCCA drivers know by now, the company is trying to track damage on the new trailers. They need documentation of a trailer entering a site with no damage and leaving the site with or without damage. If a trailer leaves a site with damage, they can identify where it happened. The company has started a new process in which we will start using the electronic DVIR form for trailers on our e-logs. They want us to do a pre/post-trip inspection on every trailer we pull, using the company phone. Whether the trailer has defects or no defects, it has to be entered into the phone. ACC has spent upwards of $500,000 in trailer damage repairs last year alone. This is money that could be used elsewhere. The cost savings for the company to have the ability to bill back the responsible parties for damages can affect the future of this company and our jobs. I think it's important that we try to do our part. The Unit Meeting for December has been canceled, due to the annual General Membership meeting being held December 9th. There will be a Toys-for-Tots toy collection drive at that meeting. Please bring an unwrapped toy with you to the meeting. Also, there's a collection box for toys in the Flint drivers room. If you can't make the meeting, you can drop off a toy in the collection box, and I'll make sure it gets turned in at the meeting. Santa's Christmas Party at the Hall is Sunday, December 2nd from 1:00 to 3:30 pm. Bring the kids out for a great time. There's going to be crafts, prizes, a movie, punch, snacks, and even a picture with Santa himself. It's all free and should be a lot of fun. The Red Wings bus trip on Sunday, February 17, 2019 still has tickets available. Your $100 ticket includes a ticket to the game, transportation to and from the game, a $10 food/beverage credit, UAW Red Wings night t-shirt, and refreshments on the bus. Tickets are limited to the first 110 seats sold. I can tell you first hand it's always been a great time, and the new arena is a great way to see a hockey game. For more information on this, and all other Union events, look for the flyers posted in the Flint and Saginaw drivers rooms. In closing, I wish you all well, and remember ... always be safe out there! I hope all is well. With fall in full swing, all we can hope for now is a long Indian summer and that our leaves blow into our neighbor's yard. We can also look forward to the early Christmas season. You know the one that starts before Halloween. At least it's football season. I would like to correct an error that I made in my last Chairman's report. It seems that when I congratulated our 15-year Platinum and 10-year Gold drivers, I didn't have the complete list of all the drivers who were recognized by the Company. At this time, I would like to congratulate 15-year Platinum driver Roland Simpson, and 10-year Gold drivers RJ Allen, John Weber, Mike Glenn, Jerry Perkins, and Jeff Zuniga. Great job guys, keep up the good work. I'm sorry I missed you last month. I've been told that Smart Drive cameras are coming soon. I have set up a meeting in early November to discuss their intent of use and spell out language for training purposes only. We have language in our CBA (Article 41, Section 3) that protects us from the company using electronic devices "as sole evidence" to discipline or discharge any employee. The Shop Committee and I will be holding them to the language in the CBA and the Grievance procedure. I will keep you informed as things develop. Once again, I have bad news. It seems that ACC and GM/Milford, after over a year of negotiations, couldn't reach a deal to continue to haul cars for the Milford Proving Grounds. We've had this account for more than 20 years, and our safety record for them was spotless. We've done an excellent job for them, and the Milford drivers should be proud of that fact. Unfortunately, without a contract, our Company was left with no choice but to exit the business as of Friday, September 28th. The five drivers who were affected by this decision were moved to GMCCA. Our Collective Bargaining Agreement with ACC is expiring April 30, 2019. This date seems to be a long way off, but it will be here before we know it. I bring this up because it's never too early to send our company a message of solidarity. Our last Union meeting had one member (besides the Executive Board) show up. He didn't even have his 90 days in yet. I understand we're all busy, and Sundays are family time, but I would ask that you please get involved in your union. Only you can make our Union strong. This could be something as simple as wearing a red shirt on Wednesdays. Just think, if everyone did that, management would start asking, why are they all wearing red, and find out it's because we're showing our Solidarity. Think of the strong message we can send just before negotiations begin. I can assure you the company is preparing for the upcoming negotiations and we should be too. Little things to show a membership united will go a long way. Speaking of red shirts, the annual Red Wings bus trip is scheduled for Feb. 17, 2019. There will only be two buses going, and when they're full, they're full. See flyers posted in the driver's room for more information. In closing, I wish you all well, and remember .... Always be safe out there! I hope all is well. I don't know if there's a better time in Michigan than the fall. Cooler weather, leaves changing soon, apple orchards opening with fresh doughnuts and cider, and let's not forget football season. With fall almost here, that also means schools have started back up. Keep in mind that kids are out there walking to and from school. Busses are out on the roads picking up and dropping off kids. Please watch out for the red lights on the busses and give them plenty of room. Remember, kids can be unpredictable, so take extra time to watch out for them. The new trailers are arriving and the old ones are being put out of service. This trailer swap is taking place at the Flint Terminal. The Company has designated 20 trailer spots in "D" row for the old trailers to be staged, inspected and taken away. Unfortunately, this process will be going on through the end of the year and into the first couple of months of 2019. Please be aware of this process and make sure the empty new trailer you're hooking to is ready to go before you take it. As most of you know, Penske rolled out a new driver safety recognition program last fall, for the 20-year injury- and accident-free diamond drivers. This fall, they have rolled out the 15-year platinum, and the 10-year gold driver's recognition program. I would like to congratulate our 15-year platinum driver, Randy Jezewski, and our 10-year gold drivers, Scott Hanson, Tim Abbey, Ken Beckman, Jim Clark, John Cockerham, Tim Cote, Brad Crawford, Larry Doby, Jeff Farley, Jim Hale, Miller Haymer, Dave Kaczmarek, Keith Tyler, and Derek Vogel. You are the best of the best. Your commitment to safety and your safety record is second to none. Great job! Keep up the good work. The Local is going to put together another Red Wings bus trip in February, 2019. As soon as the flyer comes out, I will post it. This is a great event that I highly recommend. Also, the Black History Committee is doing a polish sausage fundraiser on Friday, September 28th from 9:00 am to 3:00 pm or until gone. Stop by and pick up one or two. They're really good, and it's for a great cause. I hope all is well. I also hope everyone is enjoying their summer. It won't be long before it starts winding down and fall is here. In the meantime, make sure you get out and have some fun and enjoy the weather while it lasts. We seems to be having a rash of accidents as of late. Most of them have to do with backing up and hitting fixed objects. I know we have been working long hours, and in many cases through the weekends. We may even have a lot of things on our minds throughout the day, but when it comes to backing we need to clear our heads and focus on the task at hand. Use the G.O.A.L. method and "get out and look." By all means, if you don't know... don't go. I know we are better than what the current trend is moving towards. Please be careful in whatever you're doing. While I'm on the subject of safety, the safety drawings that have been held in the Flint Terminal will soon be started in Saginaw. The safety team in Saginaw will be looking at the way Flint is doing it and tweak it to fit the Saginaw terminal's different safety issues. With September approaching soon, the Joint Council and regular Unit Meetings will be starting before you know it. Look for postings of the times and dates of the meetings as it gets closer. The Local has reminded me that they have discounted tickets to Renaissance Festival. They're being sold at the Hall. Adults are $18.00 and kids $11.00 each. If you have any questions or are having trouble getting over there while the Hall is open, come see me and I can help. Our Unit Chairman Jim Hall is still looking for members to fill some vacancies in several standing committees. If you're interested, please see me or Jim. We would love to have more members get involved with our Union. Whether it's joining standing committees, meetings, or recreational activities, please join us. I encourage you to get involved and participate. In closing, I wish you all well and remember... Always be safe out there! I hope all is well. Summer is in full swing and we're all busy with outside activities. Make sure you take time to get there and enjoy friends and family. Keep in mind there are motorcycles, bicycles, and pedestrians out there enjoying the outdoors, too. Just watch out for them, and remember to always look twice to save a life. All the new trucks are in service now. It sure is nice to have a truck in which everything is working properly, especially the air conditioning in this heat. Now that the new trucks are in use, it has been brought up by the company that they want to set up meetings to discuss the installation and use of "smart drive" cameras. I will tell you again, I don't want or like cameras in the trucks. I will keep everyone posted on any future meetings on this matter. I will also be asking our International Servicing Rep. Scott Henry to help negotiate a solution to this. Speaking of equipment, I recently received word GMCCA and Penske have reached a deal and signed a contract for new trailers. That's great news, because it means we will seeing new trailers arriving soon. I have been hearing from several drivers that Plant #77 has become a safety issue. I took Senior Operations Manager Jeff Moriarty over to the Plant to look around. I agree, it's an accident waiting to happen. It seems someone at the plant has decided to add a row of trailers in the center of their lot. What once was a single row of trailers is now a double row. In my opinion, they have created a problem that, in most cases, we don't have enough room to back a trailer into a spot. I am working on a solution to this problem. In the meantime, I want you to be aware of the problem and please be extra careful at this facility. If you feel you can't get your trailer into a spot safely, don't force it or take a chance on hitting something. Call for an onsite switcher to put it in the spot and then call dispatch. If we just "put up" with the risk, the problem will never get fixed. Unit Chairman Jim Hall has asked me to remind our membership that there are some standing committee positions available. Our Recreation, Union Label, and Veterans Committees are still open. If you are interested in any of these standing committee positions, see Jim or me, and we'll tell you how to sign up. I hope all is well. With summer just getting started, we can finally get out and enjoy some of the outside activities which Michigan has to offer. Whether it's camping, boating, grilling out, or sitting in the shade, we all need family time and that's what's important. We should not be sweating the small stuff. Don't let the stress of work bleed over to your family life. The new trucks are being swapped out with the old trucks. By the time this Chairman's report is out, the process will be completed. I've had an opportunity to drive one of them, and they're nice. The inside of the cab is quiet, and they ride nice and smooth. Now, the way that management handled the transition could have been done a little better, and the long wait for plugs for the tracking system wasn't planned out very well, but it's done and that's what counts. I haven't heard anything about the new trailers or when we will start seeing them, but I'm sure it won't be long before they start arriving. The Company has submitted a bid to GMCCA for new work - twenty-five loads a week for a year, from Swartz Creek Plant #1 to Fort Wayne Assembly in Roanoke, IN. Management came to me and said they wouldn't submit anything unless I would be willing to negotiate a trop rate for the new work. I looked at the run, and then asked a few drivers who have run it how long it took to complete. I then applied the bid board formula to it and came up with between 9 and 9.5 hours to run it. I agreed to a trip rate of 10.5 hours. That's 8 hours straight time and 2.5 hours overtime for a flat rate of $205.63 per day. Any delay time will be added to the flat rate, as long as it's reported and documented. They submitted a bid based on the $205.63 per day trip rate. I was told GMCCA agreed to the company's pricing and we were awarded the work. The new jobs will be posted by the second week of July and start running on July 16th. This is five new jobs added to our Flint Terminal. With that good news, we are looking to hire some new drivers. I was told five or six. If you know anyone looking for a job, let them know. Make sure they put down that you referred them, so you get the referral bonus. If you don't know how that works or where they need to apply, get with management or your Shop Committee and someone will help you. I think with new trucks, new trailers, new work, and new drivers.... our future is looking brighter. We still have to strive to work safe and efficient to be competitive in this business, but the things I see happening and the direction this company is headed is promising. In closing, I wish you well, and remember... always be safe out there! I hope all is well. Now that spring is in full swing and the weather is nice, keep in mind that there are more people out and about. Please take extra time to look out for motorcycles, bicycles and pedestrians, as they are everywhere. With Summer just around the corner and lots of outside activities planned, it seems our weekends fill up fast. With that said, once again, our Regular Membership and Joint Council meetings have been suspended for the summer. They will resume in September. Enjoy the summer weekends off. I know I will. The sign-ups for District 2 Alt. Committeeperson were held on May 14th, 15th and 16th. One person signed up; winning by acclamation. I would like to congratulate Jim Hale on becoming our new District 2 Alt. Committeeperson. I think he will do a great job. With him working on 2nd shift, he will be an asset to our Membership. As most of you know, the new trucks have arrived. I was told there will be 48 new trucks added to the fleet. This is good news. This means most of the old trucks on the GMCCA account will be replaced. With a reinvestment by the company on new trucks and with new trailers on their way, it should make our jobs a little easier, just by having fewer break downs, and everything working properly. With new equipment, there will be new expectations by the company. They want their investment to last. They will expect us to keep the inside of the truck clean and damage free. They will expect us to document and report any new damage on the truck and/or trailer. A little pride and care in our new fleet will go a long way in keeping them nice for a long time. The new trucks are all keyed differently and that means a new procedure will have to be implemented. At the end of your shift, you will have to turn the truck key back into dispatch, as it will be needed for the next driver. This doesn't mean that you can't go out on your own and have a key made at your own expense, but the company needs to keep the original. The company has not counter-offered our proposal on load pay. In fact, they have not said a word about it since I turned it in weeks ago. It may have to do with load volumes being up where they need to be to at least break even or the fact that they are starting to track productivity. The company has begun to gather data on every driver in the GMCCA account. They are looking at revenue generated to the truck per hour and what the percentage of wage is from the revenue generated. The company has priced the business with a percentage of wage and revenue-per-hour goals in mind. With this base line goal in mind, they are planning to analyze the bottom drivers and look at what caused them to fall under their goal. This is not a "witch hunt." In fact, I think once they start looking at the reasons drivers are falling short, they will realize that it's probably not all the fault of the driver, but route design, delay time, break downs, and dispatch. After they analyze, and hopefully correct, some of the causes that keep us from reaching our goal, we can bring up the productivity. If productivity is good, there will be no need to even consider load pay, which I was honestly never a big fan of anyway. I have not met with Labor Relations yet on the cameras in the trucks, nor the intended use of them. I also don't have any time frame on when, or if, they are coming. The new trucks do have a camera in them, but it's a factory installed one from Freightliner, and has to do with a safety control system installed in the truck. It has nothing to do with monitoring drivers. In closing, I wish you well, and remember .... always be safe out there! Hope all is well. Like most of you, I'm still waiting for Spring to arrive. The little tease we had a few weeks ago was just that, a tease. I'm ready for the real thing. The load pay discussion has come up again and, as promised in prior Chairman's reports, I am letting you know. I was asked to put together a team of drivers to draft a proposal to give to them. We looked at examples of runs, worked out the bid board formula on how many hours it would take to run the runs, then compared the current hourly rate verses the proposed load pay rate. We think we have come up with a load pay rate that is comparable to our hourly wages. The proposal is just that - a proposal. It's step one of many that has to take place before we would go to load pay. The most important step would be a vote by the membership to accept load pay or not. I've heard rumors about me already accepting it. That is not true. The only thing that has happened, so far, is that I've sat down with the team of drivers, and we've put together a proposal. It has to go to the company, where their people will look it over to see if it adds up to them. If they change it or tweak it, we will look at it again. When your Bargaining Committee and the company come up with a draft proposal that is satisfactory to both sides, then and only then, it will be brought before the membership for a vote. As I have stated in the past, and will say now, we will NOT go backwards on pay. This was posted on April 9th. The polling will be at Flint, Saginaw, and Flint South (Warren). Our Unit Chairman, Jim Hall, has two openings for standing committees that he would like to fill - Veterans and Recreation. Any Veteran who would be interested in helping Veterans in the community, and any member who would be interested in helping to plan events for the Local, should speak to Jim Hall and get involved in your Union. In closing, I wish you all well, and remember.... Always be safe out there. I guess Old Man Winter just doesn't want to let us go. I hope the old saying... "If March comes in like a lion, it will go out like a lamb" holds true. Like most of you, I'm so done with Winter. The Flint Terminal will be seeing some changes in the management. There will be people moving to different shifts, moving up, and moving on. There will also be new people being put in place. We'll have to wait and see how it all plays out. That's all on them. I don't see it affecting us too much. Look for upcoming postings for sign-ups and an election for District 2 Committeeman. The position was vacated by Otis Campbell and needs to be filled as soon as possible. In the meantime, Alt. Committeeman David Glaza has stepped up and is doing a great job. Please contact him with your Union needs or, as always, I'm also available. I'd like to set some things straight about the possibility of cameras in our trucks. Number one, I'm not in favor of cameras in the trucks. Like most of you I've talked to, it;s not that big of a deal if they would be put in there facing out towards the road. It may even save your job or prove that you did nothing wrong. The problem I have and most (if not all) of you have, is the camera they want to point at the driver. I feel that it's too intrusive and the only reason they want it to point at you is to point the blame on you. They are claiming it will only be used for safety training purposes. This is coming from the Corporate Safety Department. If I'm not successful in keeping them out of the trucks, I will be holding them to their claim that they will only be used for training. If they try to use it for any kind of disciplinary action, it will be a violation of the CBA, Art. 41, Sec. 3, and I will be instructing Committeemen to write a grievance. Look it up! If they want a fight, they will get one. Zero tolerance on this issue. I would like to congratulate the Milford group for another year of injury and accident free service. Great job! The work that they do, day in and day out, has a very good potential for injury and their commitment to safety is second to none. In closing, I wish you all well, ad remember to always be safe out there. I hope all is well. Things have settled down, and I'm happy to report that everyone who was forced out on layoff is back to work. After a bi-annual bid board in Flint and Flint South, the affected laid-off drivers have bid, and reported to work on Monday, February 12. That only leaves a handful of drivers left out on a voluntary basis. Saginaw and Flint West (Lansing) will have bid by the time this report has gone to press. We should be all set until the next bi-annual bid in August. Our own Shop Committee, Unit Chairman and I had the privilege to attend the White Shirt Day Celebration on Friday, February 9. In spite of the bad weather, there was a very good turnout this year. The celebration was bitter sweet though. It was the first year there were no living Survivors in attendance. It's very important that we keep their legacy going and remember the sacrifices they had to endure to reach the first UAW/GM contract. A contract that allowed for safe working conditions and fair wages; one that most importantly earned them the respect they deserved. It also showed the company that the workers were an integral part of their success and not just a replaceable body standing on an assembly line. Also during the celebration, the V-CAP pickup truck raffle winner was drawn. The winner was from our own Local 659, a retiree from the old Delphi plant. Congratulations to James Flemming! Enjoy your new truck. March is just around the corner and with that spring won't be far behind. I know most of us have had enough of Old Man Winter. To kick off the start of Spring, the Annual Irish Extravaganza is going to be held on Saturday, March 10, at Local 659. It's a night of authentic Irish music and lots of vendors. Please see the flyer. Also, look for a flyer posted in our driver's rooms. In closing, I wish you all well, and remember to always be safe out there. I hope all is well. With the holidays over and the new year upon us, let's hope for a better year ahead. 2017 was a difficult year, to say the least. We closed the Fort Wayne terminal early in the year, and ended the year by closing the Lansing terminal. We lost a large percentage of work; and with that a large number of good jobs and quality drivers. For all you who remain, the Shop Committee and I would like to thank you for your professionalism and commitment to safety through these troubling times. We shouldn't dwell on the past or the things we can't change, but move forward, and continue to do the best job we can. We should know that we are still the best in the business. The new year is looking brighter and should bring us some stability. With a two-year deal from GMCCA in place and load counts steady, we should not have to go through any more reductions of any kind for a while. In fact, we have already called back some laid-off drivers and it looks like most, if not all, will be called back very soon. It seems our company has miscalculated the number of trucks they need to keep the business running smoothly. If you ask them, this is not the case, but I think we can all draw our own conclusion. As a result, there seems to be a shortage of trucks at certain times of the day. Please be patient. I'm working with management to fix the problem. Also, I'm told we should start seeing some of the new trailers soon. As they start being put in service, the old ones will start being taken out. Sometime early February, I will be asking for the regularly scheduled biannual bid. This will be a normal bid and will only include jobs run out of the terminal that the bid board is associated with. So, in other words, we are back to the normal bid process. Just a couple reminders going into February. The annual Super Bowl Pancake Breakfast is Sunday, February 4 from 8:00 am - 12 noon at the Local 659 Hall. It's all you can eat for $5 per person, with kids (under 10) free. Please come join us. It's great food at a great price. With February 11th falling on a Sunday this year, we will celebrate the 81st Anniversary of the Sit-Down Strike on February 9th, This year's White Shirt Day event will be hosted by Local 651. Also, the Local 659 calendar is out and available for free. They are nice calendars and have all the GM holidays and our Union meeting dates marked. Come see me if you haven't already received yours. I hope all is well. As Christmas approaches quickly, it seems there is never enough time to get everything done. With all the hustle and bustle of the holiday season upon us, make sure that you take time for what's important - spending time with family and friends. Please remember, if you find yourself somewhere and you've had a little too much Christmas Cheer, find yourself a designated driver and make it home safely. Otis and I recently had an opportunity to volunteer in "Operation Food Cheer." It gives me a good feeling inside to see all the donated Christmas gifts collected, then given out to children all over Michigan who are in the foster care system. I would like to think that come Christmas day, a child who can't be with their family will have a present to open. Hopefully, it lets them know that someone cares about them and wants them to have a good Christmas. It's quite a large endeavor and takes a lot of volunteers to make it happen. I'm glad we had an opportunity to participate. ACC has finally reached an agreement with GMCCA. This is good news for a change. It will renew a contract between them until December 2019. With load volumes high, and no end in sight, I think we will stay busy for a while. I would like to address the rumors about us going "load pay." The company has asked me if I would consider going to load pay. I told them I would only consider it if it was structured correctly - NO pay cut, NO working for free, NO favoritism, NO free-for-all, like it was in the past. I was told that if we could come to some sort of mutual agreement, they would go back to GM and ask for a three- to five-year deal. I can assure you that any deal we can work out will come before the membership for a vote. You, the membership, will have a voice in this. There are no discussions currently going on, nor is there any scheduled on this matter. I will keep you updated if there are any changes. I would not be doing my job as your Chairman if I didn't consider any and all opportunities to secure long-term work, or look at ideas that could benefit our membership. ACC has also reached agreements with Nexteer and the Milford Group; both are three-year deals. This is great news and it keeps Saginaw drivers and our car haulers working long term. Unfortunately, there is no change on the inbound freight side. WE are still losing all of that work by the end of the year. When all this started, we were looking at upward of 60 drivers impacted by the loss of work. Through drivers transferring, retiring, and finding other jobs, that number has dropped considerably. By the time this report gets published and the Searchlight paper gets to you, the bid process and lay-off will have already taken place. If you are one of the drivers who has been laid off, keep in mind that if any work comes back, you will have the opportunity to be called back, in order of seniority. In the meantime, while on lay-off, feel free to call your Shop Committee or me. We will keep you up-to-date on any changes that could get you back to work sooner. I'm hopeful that we may get some of the work we lost, back. In closing, on behalf of your Shop Committee, we would like to wish all of you a Merry Christmas and a Happy New Year, and remember always be safe out there. I hope all is well. As of the time of this report, there is still no news on the GMCCA account being awarded to us. I know they are still negotiating. I also know they are making progress and are getting close to reaching an agreement. I will keep everyone posted. I know the uncertainty of the status of our work is very stressful, but try not to let it get the best of you. Just keep coming in and continue doing the great job you have been doing. Most of all, do it safely. I want you to go home at the end of the day the same way you came to work. With the holidays just around the corner, I wish there was better news for our membership. Honestly, there is never a good time to have a layoff, but just before the Holiday season is even more devastating. We are still going to have reduction in work and some kind of layoff. The Committeebody and I have agreed to allow the company to accept temporary layoffs from higher seniority drivers. It makes good sense to allow a driver who wants to be laid off, for whatever reason, to take the layoff, and let a lower seniority driver who wants to work remain working. We're not sure of the number of drivers to be laid off, whether voluntary or forced. The cut-off number is constantly changing. There are several things that affect it (i.e. drivers who transfer to other accounts, quit, retire, or take voluntary layoff). We also agreed to a company-wide bid board. Once we have put together the bid boards for the three available locations (Flint, Saginaw, and South Flint), we will have a better idea of what manpower will be needed to cover the work, and thus know how many drivers will have to be laid off. The process should start around the first two weeks in December. They will hand out the three bid boards, then, starting at the top of the master seniority list, they will ask you what terminal and job you want. Once you pick your job and terminal, you will revert back to the old process for changing locations. If you have any questions about how this is going to work, don't hesitate to ask me or the Committeebody. As you can see, there are a lot of things going on, and it all has to be done by the end of the year. We will be assisting the company in any way we can. We will also be monitoring the whole process to make sure they are doing it correctly. Please be patient and we'll get through it together. On a brighter note, as most of you may know, the company launched a new Driver Recognition Program this year. They kicked it off with the 20-year Diamond Driver. Next year, they will expand to 15 Platinum and 10-year Gold Drivers. This is a great way to recognize an astounding achievement. Twenty consecutive years accident and injury free is quite an accomplishment. I hate to brag, but ACC has the most drivers there from the whole Penske Corporation. This just goes to show you what I already knew, that our drivers are the best in the business. I would like to congratulate my fellow Diamond Drivers; Ernest Cobb, Gary Graf, Don Shuster, Allen Pingel, and Dan Worden for their years of safe driving. I think I can speak for all of us when I say, "We had a great time in Pennsylvania!" While at corporate headquarters, I took advantage of the opportunity to talk to the President of Penske, Marc Althen. We discussed what's going on here with our work. I was informed a meeting was set up with GM to talk about these issues. He already knew a lot about what's happening, and I made sure to fill him in on all the rest that he wasn't aware of. Hopefully, something will come of it. I spoke to someone from Safety, and working on getting the annual safety award from corporate reinstated. More information about that will be coming soon. While talking to the head of the tech department, he agreed to look into and maybe fix the issue of us not being able to back up our logs during the 30 minutes needed for our break. ​ In closing, I wish you all well, and remember to always be safe out there. I hope all is well. I wish I had good news, but unfortunately that's not the case. It's a sad day when over 21 years of service, safety, reliability, and quality no longer have a value when it comes to retaining or being awarded work from GM Inbound. The old saying, "You get what you pay for" is a sad reality that GM is about to experience. We have seen safety and service shortcomings by our competitors already. We have brought it to the attention of GM, only for it to fall on deaf ears. It seems that it's come down to, and is quite frankly all about, money, and has turned into a race to the bottom. I'm afraid I don't know where the bottom is yet. We've always been a little higher priced than some of our competitors, but our safety and service are second to none. GM has decided to not award ACC any inbound work. The work we are currently doing on the inbound account is going to stop at the end of the year. We will continue to do a great job until then. As always, our ACC drivers are professional and safe. The work we, as drivers, have provided to GM is first class and always has been. I'm sure that with the quality and professionalism of our drivers, our service will continue to be second to none until the contract expires. We are still in process of negotiating a long-term contract with GMCCA. We are looking at ways to reduce cost through the Op-Ex Program. I'm very optimistic in us being able to successfully obtain the work. There is a good opportunity for us to submit a bid that is competitive and will result in us retaining that basket of work. I will keep everyone updated on how that process is going in the coming weeks. Sometime in the coming months, ACC will be closing the Lansing Terminal, but could maintain some kind of satellite terminal in the area. It will depend on the spot buys that we bid on and are awarded. We will continue to provide GM with the quality service they have come to expect from ACC, but it will be a different kind of arrangement, namely spot buys. Spot buys are work, and work is work. They are not the long-term agreements that we have had in the past or hoped for in our future. But, if it keeps drivers working, I'm in favor of them. We are currently working on a plan by the end of the year that will help the drivers facing permanent lay off. This will include offers from Penske Corporate for transfers to other accounts. Also, our Local President, Steve Gruener, has expressed deep concern about the way this has all played out and has graciously offered his services in communicating to other plants that are experiencing growth, to see if there is an opportunity for some to get hired at these locations. I know it's certainly not the outcome we had hoped for and our future is uncertain. Just know this, I did everything within my power to keep this from happening and will continue to work hard for you, the membership. I am always here for you, whether it's to give you important information or just to talk. My door is always open. I hope all is well. Summer is winding down, school is back in session, and with that, keep in mind school busses are back on the roads, so watch out for them and be sure to yield to them. Also, please keep a lookout for school children walking to and from the bus stops. We are still participating in the Op-Ex program and have had several meetings with their team. Our goal is to look for ways to trim costs, so we are able to submit bids that are competitive with other carriers. Unfortunately, we still have a long way to go, and now there has been a deadline put in place. We are being told that we should know by September 16th what work we are being awarded. The UAW International, our servicing Representative, our Local President, and I are ALL involved and working very hard to keep work and union jobs here. As of the time of this article, we still haven’t heard anything about the work we may be awarded. Having said that, we don’t know the status of the Lansing terminal, and any rumors of that terminal closing are just that, rumors. Now that September is here, that means we are off the summer break, and regular Union meetings are going to start back up. As always, they are on the second Sunday of every month at noon unless otherwise noted. Please try to attend them; they are a very good way for the bargaining committee to get out important information to you, the membership. We can give you the facts as we know them and discount the rumors that you may have heard. In closing, I wish you all well, and remember, always be safe out there. I hope all is well. Here we are in the middle of summer already. I hope you and your family are enjoying these warm days and all the summer activities that go along with it. I know there are several Saturday's scheduled and I think we should take the work when we can get it. It appears the updated Weekend Work Opportunity Board, along with the revised sign-up sheet in Flint, is helping with the work assignments being assigned correctly. At the time of this report being turned in, there is no word on inbound freight work being awarded to the Lansing or Flint terminals. Just know that I'm working very hard in trying to get work awarded to us. We are participating in an Op-Ex program with the International UAW and GM to help gain more work. The program will identify cost savings and will be beneficial in helping us submit a more competitive tool. There was a special meeting held on Sunday, August 13, 2017 for a discussion and ratification vote to extend the current CBA. After an explanation of the offer, there was a question and answer session, and then a vote. The contract extension was passed. Scott Henry (our International Representative) and I will be signing the extension soon. This will extend our current CBA until April 30, 2019. I think this was a good decision by our membership, as it should help secure long-term contracts for work with GM Inbound, GMCCA, and Nexteer. The Tiger's game was a great success and fun was had by all. Our Local and the several various standing committees are constantly planning activities and are always trying to get the membership engaged. Check the driver's room bulletin board at your location for upcoming events. I guarantee you'll have a great time partaking in Union activities. First of all, I would like to congratulate all newly elected Chairpersons and other Union officials. I would also like to thank all of you for your support in the recent election. I'm honored to have the opportunity to serve as your Shop Chairman. I will work hard to represent all of the membership. I am willing to put in the long hours to achieve this goal. As part of giving the membership the representation it deserves, I have reinstated the Committee Call Book in all the locations. This book is a way for you to communicate with your Shop Committee representation when they're not present. It also documents any reoccuring problems that may come up. I've also placed copies of the Collective Bargaining Agreement in all the drivers' rooms. They're there for you to look things up. There's a lot of good information in it, and I'm a firm believer in an informed member is far better off than one who's not. On a sad note, I'm very sorry to have to announce that our Fort Wayne, IN terminal has closed. They've lost all their spot buys and have not been successful in retaining any other work to keep the doors open. This unfortunate turn of events has left the company no choice but to permantently lay off the remainder of drivers in this location. These were good UAW Union drivers who are not on the street. This is a prime example of how competitive the transportation industry market is these days. It's also an example of how important it is that we, as drivers, try to help keep costs down for our company to remain competitive. I would like to thank Pete Peterson for his many years of service to this membership. I wish him well. In closing, please remember to always be safe out there! As the old saying goes, March came in like a lion. To everyone who sustained property damage, we hope it was minor, not too costly, and that everything is back to normal. Congratulations are in order as the profit sharing has been paid out to all eligible associates. This is the first time in ACC history that we hit the margins necessary for the payout. This was a great team effort by all involved and a big thanks to all drivers for their hard work and dedication. Lansing Delta has announced the elimination of the 3rd shift beginning in May. This reduction will idle 1,100 workers at that facility and have a significant impact on our inbound business across the network. They are also projecting four weeks of down time scheduled to begin the second week of May. Flint Truck continues with its consistent 6-day schedule, which includes eleven Saturdays through July. Fort Wayne has a similar forecast, showing nine Saturdays through July with some down time to follow in August. The CCA load count also remains consistent, but we still experience the spikes on Thursdays and Fridays. We've been asked to help drive home the need to document and communicate all delays. The delay information can be forwarded to the LLP when necessary to protect our on-time delivery metrics. The parties have signed a new service agreement at Nexteer, which will expire on the 31st of December. The customer thus far has not agreed to the increase of our four-year-old rate. We will be exploring all opportunities other than labor, to drive down our operating costs and secure a longer agreement. We will be soliciting driver input to help with the identification of inefficiencies within our combined network. Please find the necessary suggestion forms in the driver's room or in dispatch. Any measurable savings we can capture, whether it be fuel or systematic, will go a long way to help reduce operating costs, improve the bottom line, and increase our ability to successfully win future work. New bid boards are completed at the main locations and will take effect upon our return after the holidays. Purchasing has made some changes to the entire inbound bid process which resulted in us being awarded the service agreement for some different suppliers. The boards will be a bit different, but as always our focus remained on the high volume lanes at our bread and butter facilities within the short haul niche. All things considered the boards look a bit different but not too bad, hats off to the bid teams for pulling it off. CCA looks strong with consistently growing work volumes. CCA has asked for our help with the empty trailer pool by assigning two drivers per day to specifically move empty trailers where needed. This will help reduce inefficiencies within the network by improving delivery metrics, freeing up the route drivers from chasing empty trailers and by maintaining the necessary revenue per hour ratios. We are in the process of hiring a number of new drivers at both Flint and Lansing locations. Please remember the referral bonus we have and if you know any eligible candidates make sure to let them know. The winter weather is here! We have already heard of some major multi-vehicle accidents around the state. Please be extra careful at sundown, but especially careful with the wind driven snow. We’ve all had those long white knuckle days that at times can have you questioning your occupational choices, but slowdown, be safe and be glad we’re paid by the hour. On behalf of everyone here at the truck fleet, we hope everyone’s holiday season is full of joy, good will and quality time spent with family & friends. Remember each moment spent together as a family is not just a cherished memory it’s food for the sole. Until next time, here’s to a Merry Christmas and a happy prosperous New Year. Phase two of the parking lot improvement is underway and ahead of schedule. This phase will include finishing up the Bristol Road entrance and the resurfacing the west lot. It always seems that when addressing one particular safety issue, it inadvertantly creates another. With the smooth new pavement conditions, we have been experiencing some trucks traveling a bit to fast through the lots. Please slow down. The third round of bidding on the inbound book of business is winding down, and as of writing this report, we still have no idea which particular lanes we will be awarded. The good news is, we do know at this time that we will retain the 99 drivers currently servicing the inbound lanes. A big thanks to the International Union for their dedication and support on our behalf with the GM purchasing department. CCA volumes have steadily increased to an average of 400 loads per day. These high volumes can increase safety-related isues in bull-pens. Please be proactive and report any potential safety hazards you see, as soon as possible. The cold weather is right around the corner. Remember your foul weather gear and the additional time necessary to complete the trip. This is the time of year when our CSA crash indicator score is most vulnerable and likely to rise. The maintenance of our above average CSA scores goes a long way when costing and securing new work. Not much has changed since the September report. We are still in the 3rd round of bidding on our inbound business and all indications point to a lengthy process. As stated in my previous post, the customer has changed the entire bid process, but has since provided more of the necessary details so we can accurately cost out the individual lanes. This new process is supposed to advantage the larger, incumbent carriers who know the network history. We will keep everyone posted on any new developments regarding the inbound business. The Flint Terminal has started the Litchfield spot buy, which consists of three trips daily and four on Thursday if a Saturday is scheduled. Both Flint Assembly and Lansing Delta have six Saturdays remaining on the schedule to finish out the year. CCA Plant #1 has added 30 additional cross-deck shuttles per day, bringing that number close to 70. That addition, along with some new spot buys and the dynamic nature of service parts in general, seems to be providing plenty of overtime opportunities throughout the week with no end in sight. Every driver that was laid off last December has been recalled. It was mentioned previously that we are still in the third round on the inbound business. Depending upon the outcome of those bids, there is a good possibility we will need some additional drivers. The safety team and management have settled on a pin-puller design. After looking at several manufacturers and finally settling on one, they have decided to purchase a puller for every driver on fleet. If you haven't received one, please be patient, but they should be available upon request. The seasons are changing fast and the good driving weather is about over. Please, always keep safety a priority. Labor Day has passed, summer is winding down and school is in session. Please be mindful of, and keep an eye out for, the school buses in your daily travels. Phase one of parking lot improvements at the Flint locations are finished for the season. These improvements represent a significant investment in the Flint facility and will require some necessary new structure to the traffic flow. Pay special attention to the postings regarding the preferred traffic flow and please cooperate whenever possible. These changes should help eliminate yard incidents and greatly reduce wear and tear on the new pavement. Thanks to all the drivers who pitched in with the painting of the barricades, striping the walkways and working around the construction. Fort Wayne Assembly will be temporarily reducing production of the heavy-duty truck for six weeks. This temporary reduction is scheduled to begin on Monday, September 14 and continue through most of October. We know that by the time of reading this report, the reduction will already have occurred. Please understand that this 6-week reduction was only communicated to the ACC/UAW team on the 10th of September. All of the GM inbound business is out for bid. To date, we are in the 3rd round of the process and our main focus has been on the retention of our current book of business. Additionally, we are aggressively bidding new inbound work opportunities and looking at numerous spot buys within the network. These spot buys are typically awarded for 90 days at a time and are generally subject to renewal. Needless to say, we need to do everything we can to make sure these spot buys are serviced flawlessly. The Flint team has been awarded some new work from Litchfield to Flint assembly. This spot buy consists of 16 drop drame loads per week on all 3 shifts. We are also still in the process of trying to secure the additional spot buy of the FM 611 lanes from the Metal Center to Flint Assembly. We have retained the LGR shuttle spot buy in Lansing through October. The Lansing drivers have done an excellent job servicing this account and proven once again that safety, commitment and professionalism still pays off. The Saginaw terminal has received the new pup trailers and one more Bay City shuttle job. This is another fine example of service excellence. The Saginaw crew never fails to protect the business and service the customer without fail. I apologize if that sounds like a sales pitch, but that's exactly what it is. We need to understand that we are not only in the service business, but in the service business in a climate where 95% of this work is awarded to the non-union competition. We will keep everyone posted on any new events as they develop. Until next time, please be safe. Welcome back to all who were sidelined by the Lansing Delta and Fort Wayne shutdown. Five weeks is a long vacation (in the case of Lansing). I'm sure it went by quickly and everyone is ready to get back in the saddle. The schedule for both Fort Wayne and Delta is reflecting five Saturdays up to August and Fort Wayne showing no Saturdays through October. Flint Assembly is showing four Saturdays through August and is scheduled to be down the week of July 4. CCA will experience a volume increase leading up to the Flint Truck July 4 shut-down to support the lack of production at that facility. In addition, we have picked up 11 new rack moves from Plant #1 to the Crossdock, so it's looking like a busy summer. The one-year spot buy we had from Ypsilanti has run out and I'm told we will no longer be running the Hollingsworth shuttle. There will also be some changes with the DRDC lanes in Melvindale. As soon as we know the details concerning those lanes, we will let you know. We have seen a slight uptick in new trailer damage and I have been asked to reiterate the importance of documenting any new damage so we don't get stuck with the repair bills. Also of particular importance when performing pre-trip inspections on trailers, please keep in mind that any remnants of a hazmat sticker must be removed. We all are aware that it is the responsibility of the shipper/consignee to apply and remove the placards, but it's your ticket if you move the unit with any remaining remnants. The new parking lot project will kick off in Flint with phase 1 on June 13, with the pulverization of the front lot. The drainage issues have been addressed with the cleanout and expansion of the catch basin east of the front lot. This is a large project and will be a significant upgrade to the Flint facility. Until next time, be safe and enjoy the weather. As the calendar would indicate, the weather is improving and along with that comes the annual DOT roadside Blitz scheduled for June 7th through 9th. Please pay extra attention to lights, brakes, and tires when performing pre- and post- trip inspections. Our CSA scores (which have always been good) continue to improve. For those who don't already know, a CSA score is made up of 7 individual categories rated from zero to 100, zero being the best. Every category is important, but two of particular concern would be unsafe driving and vehicle maintenance. These two categories are not only the most visible, but the easiest for us to control. They almost always trigger a stop, a more in-depth roadside inspection, and a negative impact on our CSA score. These are very important updates to remember regarding the renewal of our required medical card. The examiner will have the option to make exam results "pending" for up to 45 days in order to wait for test results, or to get more information from the driver. During that time, the driver must rely on his/her existing medical card in order to drive. If the existing card expires, the driver would become disqualified. It's long overdue but the Saginaw terminal is updating their fleet and taking delivery of 10 new tractors. In mid-June, the straight trucks will also be replaced with new tractors and new pup trailers. Additionally, the much despised 508 series tractors currently in use at Flint and Lansing will be phased out of service. As of this writing, there is no time frame for replacements, but I'm sure we all can agree the sooner the better. We will keep everyone posted on that progress. The 5 weeks of down time at Delta for construction takes a substantial bite of the revenue which is difficult or impossible to replace. We have been aggressively bidding on numerous out-of-network spot-buys, LGR shuttle work, and CCA expedites, with a reasonable success ratio. Our CCA account remains a consistent generator of revenue in spite of the temporary reduction in volumes. We are currently looking at some additional shuttle work originating at plant #1, which will involve approximately 20 loads per day. We'll keep you posted. Spring is here according to the calendar, but apparently April didn't get the memo. Accidents and injuries are down from last year and even when facing some significant down time at Lansing Delta, 2016 is off to a relatively good start. The scheduled 5-week shutdown will have the most impact at the Lansing terminal. This will obviously affect the manpower accordingly, with some temporary layoffs. The company is aggressively bidding on spots buys in an effort to minimize the layoffs and replace lost revenue. We still anticipate a significant number of drivers will be laid off for the duration of the shutdown. As all are aware, Delta makes up a big slice of the revenue and it will be difficult to offset a 5-week loss of this magnitude. As was stated earlier, we are aggressively bidding spots buys and are exploring other work opportunities which stray from the automotive niche we've tried to carve. Many drivers have asked over the years if we were in fact attempting to diversify the products we haul. This shutdown could provide a good opportunity to showcase our expertise outside the automotive arena and replace some of the lost revenue by expanding the products we haul. If there is interest and we can find the necessary equipment, look for a sign-up sheet with further explanation. The good news for the Saginaw location is that they will be taking delivery of some new equipment. It is our understanding that the new tractors will be put into service as soon as the new trailers are completed and the old are phased out. Just when we thought winter was winding down, we get a nasty reminder that it isn't over yet. I think we all knew our luck wouldn't hold, and we couldn't possibly dodge every storm. We certainly can't complain, as the temperatures this year have allowed us to heat our homes for a whole lot less. Fuel prices also remain significantly lower when compared to last year. This is a good thing for just about every segment of the economy, which includes our own little slice of heaven. In fact, the only real complaints we hear are coming from the oil companies and their shareholders, who for some reason are having a tough time getting by on the untold billions they've squirreled away while the price was much higher. In the long run, lower oil prices should be a positive or at worst a neutral for the economy. What it does is transfer income from the oil producers to the oil consumers, who will spend the extra cash on something else. This is how we support other businesses and keep people working. The Holidays are over and it's back to the business of delivering our freight. Let's hope that the new year brings peace, prosperity, and solidarity to all. After some lengthy negotiations, we have ratified a new agreement which provides substantial increases in every year of the contract. We have maintained the current health and dental plans over the life of the contract. We have strengthened the grievance process with reinstatement language which provides our members with additional appeal opportunities. We have restored Easter Monday, eliminated the floaters for our CCA drivers, and all observed holidays will now count as "hours worked" towards overtime. We added new language that facilitates the cooperation between the UAW & ACC to pursue new/future work opportunities for the fleet. We have also paved the way for new members by accelerating the grow-in period for wages and benefits and extended recall rights for laid-off drivers by 50%. In my last article, I reported about the significant work losses the fleet sustained in the last round of regional bidding. We are still in the process of reassigning manpower by location, seniority and vacancies. It looks like this process will take some time to sort itself out as things are still changing from day to day. A word of advice - if offered a temporary assignment back at your home terminal, consider the personal impact. We will be re-bidding the boards in February. You don't want to miss out any long-term opportunities for a short-term convenience. It seems like we've been hearing about this forever, but once again 2016 (an election year) will prove to be a crucial year for the middle class. Contrary to popular belief, everything that the 1% and their paid-for-politicians have been claiming over the last couple decades about being the "job creators" just isn't true. If you think about who the real job creators are, look no further than the 99%. The middle class is the heartbeat of the economy and the nation's indispensable workforce. It was, in fact, the rise in middle-class productivity that generated much of our nation's wealth. The problem for an economy with a weakened middle class is a weakened capacity to consume; therefore, a strong middle class can only make our nation stronger. So when it comes to the discussion of whom the real job creators are, you can say with certainty that the middle-class consumers are responsible for creating 99% of the jobs. As all are aware, we failed to ratify our most recent contract proposal. Your Shop Committee is prepared to head back to the table and address the many concerns and shortcomings regarding that tentative agreement. Please understand that with any negotiation, we are required to bring offers to the membership as they are presented. We have heard the membership loud and clear. We have every intention of reaching an agreement that is acceptable to our members. We will keep you informed as to the status of the negotiations and any new developments as they become available. On November 6, a warn letter was issued regarding the fair market loss of a significant portion of our inbound business. The letter states that ACC will no longer be providing GM with certain transportation services and will be reducing operations in support of this account at the close of business on January 2. In a nutshell that means, once again we take a backseat to nonunion carriers that refuse to provide a living wage, healthcare, holidays, vacation, overtime pay, or any other hard fought benefit. We are constantly being harangued and beaten down for enjoying these negotiated benefits that in the past were commonplace across the network. Apparently, these once common benefits are now considered guilty pleasures, of which we as a people are no longer worthy. It used to be that if you were fortunate enough to be represented by a union, your wage and benefit package helped to improve even the non-union compensation. Make no mistake about it, the worm has turned and the opposite is now the new reality. Is all this because of decades of anti-worker legislation, or simply because we're union? Either way it's a tough pill to swallow as we lose 71 drivers to the ranks of the unemployed, or to the non-union segment. These jobs did not disappear; they were lost under the guise of the "fair market" and all of this, right in the face of a serious nationwide driver shortage. This tells us a few things. Number 1: we're still sorely needed (just not at our current compensation rate); 2: they're expecting us to take our expertise to a non-union carrier and work for less, and 3: the corporations (for now) are out pacing us in the battle of attrition. Nothing is sacred and every corporation knows we care about our members. They use our own compensation against us. They know full well we are responsible leaders and think of everyone. We will stop at nothing to save jobs and we will not respond with kneejerk reactions. We think long-term, even if it means we settle for a little less to save a brother or sister. This is a trap that has been very carefully laid and is precisely how they are able to chip away at everything we stand for, little by little. The parking lot issues in Flint have been addressed short term as the worst part of the driveway has been pulverized and graded flat. This fix should get us through winter when more permanent repairs can be made. Bid boards are ready at Flint, Lansing and Fort Wayne; they should be implemented by the time of reading this article. Both Flint and Lansing took a major hit in terms of lane numbers and it's easy to see that many of our high volume jobs are no longer available. It is our hope that some of this work that we've done for years finds it's way back to ACC in future bids. The fall weather is here, and winter will be upon us shortly. We should be making the switch to the winter fuel blend by months end, and along with the fuel additives comes a higher price. Please keep this in mind in your travels, and try to do our best to help control unnecessary fuel usage. We once again produced outstanding delivery metrics at 99%. In appreciation for our efforts pizza was delivered on Thursday the 8th and enjoyed on all shifts. The annual rodeo has been postponed until spring due to time constraints and logistical problems created by a full customer service schedule. Everyone is aware of the current issues with the Flint water system. I would like to give a big ole hats off shout out to every organization that stepped up and contributed time and resources to ensure healthy drinking water for the school children and the less fortunate. Our UAW members and leadership never cease to amaze by heeding the call, and taking the lead when their community is in need. Its times like this, that everyone should take great pride in their union affiliations, and the impact they have within their communities. We have extended the expiration date of our CBA for 60 days beyond our September 30 deadline while ACC negotiates the terms of a new service agreement with the customer. Please see the details of the extension posted at the work centers. We will provide additional details as soon as they become available. Once again we thank you for your continued support and confidence while we work through the negotiating process. Greetings drivers, fall is in the air and all the kids are back in school, please be extra cautious in your travels, and always be on the lookout for buses. Flint once again edged out Lansing to win the fuel challenge and had the cookout on Friday the 11th. A driver appreciation cookout will be the following week at all locations. Stand and be recognized for your efforts. We continue to safely deliver the freight on time, and keep the whole country supplied with everything from soup to nuts. Our FMCSA score continues to improve in all areas. We still remain head and shoulders above the competition, and have seen significant improvement in maintenance. Our accident/ injury metrics are trending in the right direction across the fleet, and are well below last year. The Saginaw terminal is leading the way, and is on a roll with 250 days without an accident or injury. The CCA account is once again consistently over the previous average and significant improvement has been made in trailer turn-around. The Hollingsworth shuttle spot buy for Flint South will continue through March and hopefully longer. Parking lot repair negotiations continue at the Flint location, and it is our hope that at least some of the areas of most concern can be repaired before winter. In addition it seems our Fort Wayne location is experiencing some crowding issues, and growing pains that need to be addressed soon as well. Our contract negotiations continue, but the focus has shifted from article verbiage/economics, to work volume and manpower requirements. As was previously stated, the entire inbound portion of our work, along with CCA is currently out for bid. We have yet to hear from the customer which lanes, or how many we have been awarded, so please be patient while we sort through the process. As soon as this multitude of issues is clear we will get down to the meat and potatoes and have an agreement for everyone’s consideration. This is the time when it’s necessary to stick together, speak with one collective voice, and keep the rumor mill in check. Greetings drivers, the dog days of summer are upon us and we’ll be slipping into fall before we know it. Summers are way too short to cram in all of the vacations, outdoor activities and family events we’ve come to cherish. Use your time wisely, spend it with family or friends, or maybe just to unwind and relax, but whatever your plans be careful and enjoy, we need you back here safely. Our accident/injury trend continues to improve. We are well below the previous year’s average and are currently motoring through the best stretch of the year, so hats off to everyone for moving the needle in the right direction. Our CSA Safety Score Comparison looks very good, but there are still some areas of concern. When compared other to the carriers our size we remain head and shoulders above the rest in all categories except maintenance. That’s not to say we’re bad, but it means there’s room for improvement. Please keep an eye out for any defects that could trigger a roadside and help improve on this particular category. Flint and Lansing are running neck and neck on the August fuel challenge. The numbers are so close (Flint 6.95, Lansing 6.91) that it’s anyone’s game, so if you want the perfect opportunity to get deep into B-Mac`s pocket here you go. In addition to the August fuel challenge, we are planning the annual ACC /Penske Rodeo to coincide with driver appreciation week in mid-September, so regardless of the fuel challenge outcome, everyone will enjoy the annual cookout. The only thing new to report regarding our negotiations is that a 60 day letter was sent to the company pursuant to the Article 42 duration language contained in the CBA. This is a federal procedure that is required to C.Y.A. even though our negotiations have already begun. We will keep everyone updated on any new developments as we progress. This summer's shut down is behind us and its back to business as usual. Flint Truck has Saturdays on the schedule throughout the rest of the summer, and Lansing Delta is scheduling Saturdays through October. Our CCA account seems to always be in a state of turmoil but in a good way. The one constant with this challenging account, is that our daily load count continues to rise. We are currently averaging 306 loads per day with the typical spikes at weeks end. When all is considered, an abundance of work is a good problem to have. The parking lot repairs have started at the Flint terminal and will be completed in piecemeal fashion and with as little disruption as possible. We ask for patience and cooperation while construction is taking place. The new Smith System Re-boot program has been launched, and we have targeted drivers that fall within the three to five year service demographic to start. The new classroom style structure should provide more communication between drivers and streamline the process by eliminating one of the required on-line certifications. As we are all aware, our contract negotiations for 2015 have begun. To date we have had five meetings, and have yet to present the company with our list of demands in its entirety. As everyone can imagine, the list we've compiled is quite extensive and it is going to take a fair amount of time to get through it all. We ask for your support and confidence while we work to make this agreement better for everyone. As of writing this article all of the regional bids are out, and we are waiting on the outcome. Everyone knows that these days the qualified driver is in extremely high demand. There is a considerable shortage across the country and this demanding occupation requires a considerable commitment from the individual. We spoke of these requirements on many occasions and it seems like more and more is expected from us every day, so pat yourself on the back for surviving the slaughter and remember that this is the only industry that cannot be exported, and that every commodity you touch must be moved by truck. Greetings drivers; spring has finally arrived and we have switched over to the summer fuel. The frost laws are in effect, as well as the seasonal road heaving and potholes to contend with, please pay special attention and drive accordingly. We’ve started spring with another trailer tire campaign and have expanded it to include tractors. Fuel prices are significantly lower this year, but remain one of our biggest cost buckets. As the fuel prices stay lower we tend to forget how important it is to conserve. The Flint terminal remains busy with CCA volumes consistent to high with the load spikes still being a factor on Fridays. The customer has set the bar high in terms of pickup/delivery metrics, and has an expectation of 95% on time average across the board. When we dip below the average for reasons out of our control like weather, we are required to perform at over the 95% average for a time to mitigate the failure and maintain the average. This is why making arrival windows timely, and communicating any delays to dispatch is so critical. Every carrier is basically on the point system and evaluated accordingly. Flint Truck is averaging two Saturdays per month as far as our forecast goes, so it looks like a busy year. We are still searching high and low for drop frame trailers to rotate in and replace equipment that is rapidly going out of compliance. As it stands now, there are none to be found with a favorable lease that fits our business needs. Preventable accidents are always on the radar, and have a substantial impact on costs. Please be careful when maneuvering in bullpens and around the docks. 70% of our issues are deemed preventable, and off the road so it would seem easy enough for the individual to control. We are saddened to announce that the ACC family lost an excellent driver and valued friend. Please keep the family of Pete Rohde in your thoughts and prayers. Pete will be greatly missed by all who had the pleasure of knowing him; we can say for certain that that the world will be a lot less interesting without him in it. Greetings from the truck fleet, the first significant snow storm of the season is behind us, and in usual fashion we came through with no major incidents other than playing catch-up at facilities that closed due to the weather. The preparations we made in our bull-pens to handle excess snow, have made a vast improvement in visibility and provided additional room to safely maneuver in and around the parking lots. Since 75% of our preventable accidents occur in our own, or customers bull-pens we must make every effort to minimize the accident/injury potential. Every proactive measure we take, does have an associated cost, but anything we can do to reduce the preventable accident number will significantly help lower our yearly operating expense. The operative word here is preventable; these are at fault accidents that not only negatively impact the individual, but everyone in the fleet. Please take this 75% figure into consideration when operating on site, and do whatever we can to help eliminate or at least lower that figure. As stated in the last report, our CCA account remains consistent or growing. On Friday February 6th the CCA account reached another milestone with 400 loads for the day. Additionally as of Feb. 1st we resumed servicing the Perrysburg to Ypsilanti lanes at roughly 50 loads per week. It remains to be seen how the added volumes will impact trailer turn-around. There have been multiple discussions about placing trailers in a closed loop for this particular customer but we are not there yet. We have added 10 drop frame trailers to the fleet so far, and are trying to acquire 29 more. This style of trailer seems to be a scarce commodity and difficult to find with acceptable lease terms. The powers that be are searching high and low and I’m confident they will pull a rabbit out of their hat. The new paint shop at Flint Assembly is taking shape fast, and they currently have 16 Saturdays on the schedule, averaging 2 per month through December. It’s looking like a fairly busy year going forward and it couldn’t come at a better time. We concluded our Fantasy Football Performance Super Bowl. The Broncos from Lansing won the competition and the Buccaneers of Flint took 2nd. Both teams will have a choice of jackets. Great job to the winners and to everyone else better luck next time. Happy New Year from the fleet. We hope everyone had memorable holidays and plenty of quality time with family and friends. 2015 has started off right with gasoline prices low, and a bull market driving the economy in the right direction. Let's keep our fingers crossed that the postitive trends continue through the rest of the year. By the time of reading, we will have been paid out for the safety/lean bonus and any unused vacation that was due. New bids boards either are, or will be, implemented at all locations for the next six months or until enough changes constitute an update. Our CCA account continues to grow. Our bid team has created as many static runs as feasible to better utilize equipment and minimize missed windows with the more structured arrangement. One important point to remember is that we originally bid the CCA business at 230 loads per day with 50 drivers, now we are averaging 350 loads per day with 90 drivers in just two years. We are in the process of hiring more drivers to meet the increased load volumes and reduce the need for temporary help. Love it or hate it, CCA has become a major source of revenue for our fleet and a major source of hours for our drivers. 2014 ended with a substantial reduction in our ALGL rate that we hope carries into 2015. Accidents and injuries are not just bad for the individuals involved, but increase operating costs across the fleet. Please take all necessary precautions in bullpens and on the road to help keep operating costs as low as possible. The winter weather has been a big improvement from last year, with above normal temperatures and below normal snow fall predicted. Let's keep our fingers crossed that cut all the current predictions for a milder winter are true and correct for the next few months. We've had numerous complaints about the condition of our Flint parking lot over the past couple seasons. Please understand that there wasn't much we could do but a Band-Aid repair, until the drainage issues were dealt with (the real source of the problem). When you have over five acres of pavement, this can create an enormous amount of run-off and snow banks, which when melted need to go somewhere. Until recently, the water just sat in the low spots and compounded the already big problem. To date, phase one of the parking lot repair project should be wrapped up before any major snowfall accumulations occur and should be finished when the weather breaks next year. We now have plenty of room for piled snow and much better visibility in and around the yard. Our CCA account, as always, remains consistent at around 300 loads per day. Whenever possible, we are promoting the addition of more trailers into the loop, which will provide more efficiency on our end and give us a fighting chance to maintain our excellent performance metrics. We have either hired or are in the process of hiring over 12 drivers within the fleet, the bulk of which have been at the Flint location. We will keep you posted about any future positions that become available. We are still actively collecting driver suggestions. So if you have any ideas which improve our business, please fill out a form and turn it in. We have received many good suggestions over the last year and all suggestions are evaluated by the team for merit and responded to, whether implemented or not. The second Annual ACC Rodeo finals were held November 4. Congratulations to the Flint Terminal for winning the finals, and holding the plaque for the next year. Flint is having a Chili Cook-Off on December 12 and it looks like we have plenty of contenders looking for bragging rights and a prize for the year's best chili recipe. I look forward to many samples. Until next time, have a safe Merry Christmas, and a Happy and Prosperous New Year. PROTECT YOUR JOBS! SUPPORT YOUR UNION! BUY AMERICAN! We hope everyone's summer was eventful, and that all took advantage of some quality time with family. When the plants are running at full capacity, it brings all the repercussions of the federally mandated H.O.S. changes into full view. This problem is not unique to ACC, as the additional cost of not doing business is being experienced by every motor carrier currently operating within our network. At a recent carrier meeting involving GM and the LLPs, a network re-design was one of the main topics of discussion. The full impact of the network redesign won't be completely understood until we are made aware of equipment changes that were necessary to bid on particular lanes. It has been suggested that the customer is exploring the possibility of employing the use of multi-axle trailers in an attempt to consolidate loads and reduce H.O.S. issues across the network. As everyone knows, we use standard and drop-frame tandem trailers exclusively within our fleet, the exception being some specialty trailers utilized at the Milford car haul division. Currently, there is no plan in place to acquire any more specialty trailers. We will keep you posted of any potential changes. There have been several DOT roadside campaigns throughout the summer. We fared very well on all, so keep up the good work and please understand that the responsibility for eliminating roadside defects is ours. Be safe out there, and please be courteous to your fellow drivers. Leave it like you found it, CLEAN and full of fuel. I hope everyone enjoyed their 4th of July weekend and took full advantage of the perfect weather. Our vacation season is in full swing, so whatever your plans, make sure you make the most of it and take the opportunity to recharge and relax. The Flint Terminal reached a milestone at a 7.2 mpg average. In appreciation for reaching our goal, a cookout was enjoyed, and for once the weather was cooperative. Every Flint driver will receive a new T-Shirt with the company/union logo. The shirts have been ordered and will be handed out as soon as they arrive. Great job to the entire Flint Team, and FYI (everybody) the next goal is 7.5. Flint Truck is scheduled to work 8 Saturdays through October and continues to provide a consistent forecast. Truck & Bus remains the bread and butter at our Flint location, but CCA is continuing to gain ground. The CCA account continues to provide heavy volumes. These volumes can tax equipment requirements, but are necessary to support the recent supplier issues. Additionally, plant #72 has increased the number of loads to a total of 15 lanes per day. We were recently awarded 50 Perrysburg lanes per week, with an added monetary increase to help cover the cost of the 70 deadhead miles. Also, New Center Stamping is adding additional dock facilities in the fall to support new projects, and hopefully reduce any delays. As always, we continue to monitor trailer delay issues at suppliers and plants in an effort to reduce equipment turn-around. LGR continues to be a challenge, based on their scheduled down time. Our most recent attempt to bid on work at that facility has not had a positive outcome. We are required to bid work based on 47 weeks. To my knowledge, we only retain 2 lanes associated with LGR. At the time of this writing, we are in the middle of bidding on both the Detroit and Grand Rapids regional bids. We will keep you updated as to any new developments. Drivers be advised; the DOT, in their infinite wisdom, have decided that the BMI is a reliable indicator of body fatness. News flash, it isn't! This is a fundamental error of logic. For example, if I told you my birthday present was a bicycle, you can conclude it has wheels. That's correct logic, but it does not work the other way around. If I tell you my birthday present has wheels, you cannot conclude that I received a bicycle. I could have received a car. If a person is fat or obese, he or she will have a high BMI. But as with the birthday present, it doesn't work the other way around. A high BMI does not mean an individual is overweight, let alone obese. It could mean the person is fit and healthy, with very little fat. These are the arbitrary rules with which we must comply. Talk about a broad brush. This is bureaucracy at its finest, as there are plenty more scientifically sound methods available to measure obesity levels. It's insulting that our livelihood could be determined by a 200-year old numerical equation, developed by a mathematician and not a physician. This current method, flawed as it is, could easily and unfairly affect the duration of your physical card. Please pay attention and try to prepare for these possibilities. The elections are over and I would like to thank everyone for their continued support. I would also like to take the time to congratulate our newly elected Shop Committee members beginning with re-elected District #1 Committeeman Terry DePetro, and District #4 Committeeman Randy Howard, District 4 Alt. Committeemen Don Ruthig, and John Mertz. I look forward to working with these gentlemen going forward, and I am confident that the membership has made solid decisions. I would also like to thank outgoing District #4 Committeeman Dan Sain for his many years of service to the membership. He has been a great asset to the entire team. His experience and leadership was/is always valued and appreciated. Danny will still be actively involved as Trucking and Logistics counsel President. The first quarter safety/lean bonus has been paid out. Hats off to the qualifiers, and thank you for your fuel saving efforts. Since this program was negotiated a year before it was implemented, we did expect some systematic issues with the criteria based on job dynamic, equipment differences, and just how the data is officially recorded. We thank you for your patience and support while we straightened out the complex, circular logic responsible for this disconnect. We have since worked through a multitude of route tracker issues, and reached a compromise that should please the inter-plant membership going forward. As a general rule, we try to never air our dirty linens in public; however, sometimes it's blatantly obvious that you can't trust these companies any father than you can flap your arms and fly. For that and many other reasons I end every article with "Support Your Union" The Union can only be effective if they have the full support of the membership. Solidarity is a two way street, you support the Union so they can support you. This mess we find ourselves in didn't happen overnight. It has taken 30 years of bad legislation, economic chaos, and a laundry list of other contributing factors working in concert to beat the Unions back to where they find themselves today. We are required to work within the confines of the verbiage contained in the CBA, and with the additional headache of anti-labor legislation it can make for an uphill battle. Thirty years is a long time, and it's going to take some serious damage control at the ballot box to put it right. Please support union friendly candidates. Spring has officially arrived, and it seems that the weather is finally going to improve, allowing us to get back to what we would call normal operations. When all things are considered, we did perform well, statistically, in spite of the weather. We did have a few weather related incidents on the road, coupled with numerous maintenance issues, (once again weather related), that negatively impact FMCSA, A.L.G.L., and on time delivery metrics. Overall, we continue to perform very well given the circumstances, and if history is an indicator these issues always resolve themselves as the weather improves. Once again the load volumes remain consistent within the CCA account, and some of the trailer issues are being sorted out between the parties. The customer has agreed to add 50 additional trailers to the pool, and is exploring options which decrease equipment turnaround. These fundamental changes should dramatically increase equipment availability for us, and improve productivity within the entire account. ACC and Nexteer have signed a new two year service agreement which provides additional security for our members at the Saginaw terminal. Without a doubt, the main reason for this new agreement was a direct work result of the hard work, and dedication of the drivers. This is a perfect example of protecting your jobs through outstanding performance, strong relationships, and mutual cooperation. Excellent work and hats off to the entire Saginaw team. We have our foot in the door with some new daily with some new daily expedite opportunities involving rail containers. These are primarily drop & hook, and this work could also be available on weekends. This work will probably last as long as there is a container shortage, but the expedite rate is very good, and it could lead to some new possibilities going forward. We are still in the process of rotating in the new Bowmen Wabash trailers into the system, and the Lansing terminal will be receiving the next group as they become available. We are currently in a holding pattern until arrangements can be made to switch them out. ACC and the Local Union have agreed to the addition of another union representative for our Fort Wayne location. The member density, and work volumes have grown to a point where they are not only support, but require the additional leadership. We consider this a hard fought victory for the membership in Fort Wayne, and look forward to the valuable input from that elected person. Please remember to document, and communicate all delays to dispatch as soon as possible. This is important for several reasons. When documented properly, it holds suppliers accountable with a paper trail, and provides us with the opportunity to stop the cascading effect on our metrics. Service is what we sell, so once again it's incumbent upon us, to be responsible, and keep the lines of communication open. Every effort must be made to report, document, and whenever possible assist in the better utilization of our equipment. Until next time, be safe out there, and thank you for your continued support. January 2014 will not be forgotten soon. Record snow and cold has presented many challenges that are expected to last the entire winter. Plant down time, fixed costs, snow removal, maintenance of equipment, along with numerous weather-related delays have taken a brutal toll on the P&L's early in 2014. Even when presented with these difficult challenges, our people once again have taken it all in stride, and continued to provide the same exceptional service that our customers have come to expect from ACC. Believe me, all of this exceptional service did not go unnoticed by the customer. They have sent numerous e-mails thanking us for our continued ability to perform in spite of Mother Nature's continuing arctic blasts. In appreciation of the all hard work and dedication throughout the nasty weather, all locations have enjoyed a pizza day on all shifts. A small gesture I know, but it's nice to be recognized and appreciated for what you do under difficult conditions. Hats off to whole the ACC/UAW team. We are in the process of upgrading from the old Blackberrys, to smart phone technology. These new phones will support a lot more data collectively, and are much more user friendly. We will be gradually changing out the old phones over the next few weeks, and issuing replacements. This should address many of the operational issues experienced with the current system. Additionally, as the new phones are handed out, please refrain from exploring any of the unnecessary apps that are currently available on the phone. FYI, the data usage is monitored, and you are logged in, so please, only use them for their intended purpose. The "Safety-Lean Performance Bonus" kicked in on January 1st, and is payable quarterly. Please pay special attention to your score card and take advantage of this opportunity to put some extra money in your pocket. Please review eligibility processes, and keep an eye out for any driver-controllable defects that could negatively impact your score. In closing, I would thank everyone for their continued support in a difficult market. We are still waging a war of attribution with non-carriers, and are slowly making progress. We have hired drivers in Flint, Lansing, Saginaw, and Fort Wayne, mostly through driver referral. Currently, we have more jobs than drivers, and all indications suggest an extremely positive customer forecast going forward. To date, there is no significant down time scheduled for any of the plants we service. We also have numerous Saturdays on the schedule from now through spring. Be safe out there, and please remember to take your mandatory breaks. Protect your jobs, Support your Union, Buy American! Holiday Greetings from the Truck fleet, 2013 has been an interesting, and challenging year to say the least. Not only the significant changes to the Federal laws regarding HOS requirements, but the new policies that govern driver fitness. These seemingly arbitrary new rules continue to puzzle, and perplex even the most seasoned professionals. Folks that have been involved in transportation for decades still can't fully understand the need for these changes, but can certainly see at a glance. That this could cost the industry a bundle... Again. That powerful, legal, economic, and political movement of the few last decades (called deregulation) is beginning to reveal its impact upon the industries it has grasped. During the late 1970s and early 1980s, deregulation embraced airline, railroad, telecommunications, broadcasting, banking, and motor carrier industries just to name a few. Free from the government bureaucrats, and layers of red tape, firms in these industries were tossed into the free market to sink or swim on their own. Like other deregulated industries, the motor carrier industry has been plagued by severe economic problems that are never spoken of on the evening news. The level of bankruptcies among motor carriers has been unprecedented in American business history. As the free market absorbed the industry, one negative side effect of deregulation was an unacceptable deterioration in the level of safety. Hence the need for... you guessed it... more regulation. Driven in part by public demand, and the vital nature of the business itself, we are trying our best to survive in a highly regulated, yet deregulated industry. We, as CDL drivers are held to an extremely high standard, not only in our professional lives, but our personal lives. We must meet, and maintain established physical requirements. We must have a squeaky clean driving record, are subject to random drug and alcohol testing, must know and comply with all established DOT rules, and must safely navigate the highways in all sorts of conditions, and deliver our freight in a timely manner. Choosing to be a professional driver and taking on these responsibilities both professional, and personal does in fact make you a better person. In our case, it's reflected every day in the level of outstanding service, safety, and teamwork our people provide. The Company is making investments in the future in the form of new equipment, which allows us to remain on the leading edge of new technologies. We have renewed leases on properties, and are making many significant upgrades to improve safety and facilitate the daily operations. We have both the Local and the International Union working directly with ACC to control cost, and remain competitive within the bidding process. All of these factors, along with an improving economy, and an extremely positive customer forecast, are pointing towards a very bright new year for the fleet. We have many people to thank for our continued success. First and foremost we, would like to thank our hard-working membership for the dedication, and support you have given us throughout the year. We also owe a great deal of thanks to both the Local, and International Union. We have been to the well many times for help and guidance with too many issues to count. They have been with us every step of the way with unwavering support and a dutiful dedication to our members. Please remember to take your DOT medical card to the Secretary of State, for their records. If this is not done by January 30th, it could jeopardize your CDL/FYI this must be done each time your card is renewed. Have a safe, and Merry Christmas. We look forward to a happy and prosperous new year. It looks as if the warm weather is gone. We can look for the temperatures to start the seasonal downward slide towards freezing. Along with the cold temperatures, come the associated hazards like slip & falls, frosted windows, and inclement weather. Please be extra careful, and report any and all safety-related issues that could potentially cause a problem for the next driver. The new International Replacement tractors have arrived, and have been put into service. We are currently in the process of sorting through the remaining Internationals, and keeping the best performers. We are also expecting to take delivery of the 18 new Volvo I-shift tractors sometime in mid-November. The majority of these units will put into service at our Fort Wayne location, and the remainder split between Flint and Lansing. We are also in the middle of rotating in the new Wabash trailers into the freight side production system. Please understand this is a process, and will take some time to complete due to logistical, and cross-docking issues. This new equipment resulted from a committed "Lean Team," a slam-dunk business case, and an informed business decision to move forward. This is not only very nice equipment, but is considerably lighter, which saves fuel and has a substantially cheaper lease, so everybody wins. The daily SPO load volumes continue to raise along with our improving pick-up and delivery metrics. We need to continually focus on maintaining our score relative to the increasing load volumes, and continue the positive trend. This is a highly competitive market but still a very consistent one. The primary reason for the increased daily load count is a direct result of your outstanding hard work, and dedication to the metrics monster. I would like to thank both the Local and International Union leadership for their considerable help with the service extension on our SPO trailers. Without the staunch support of the UAW Leadership, I know for a fact this would not have happened. This was an extremely complex issue, which required a great deal of due diligence, and supportive engineering data to ensure the safety of everyone involved. This is just one more example of how fortunate we are to be part of a proactive organization like the UAW that will stop at nothing to save jobs. Special thanks to Director Jewell and his wonderful staff of dedicated people. The Flint terminal won the summer fuel challenge. Everyone received a t-shirt for their efforts, and had the opportunity to enjoy another outstanding cook-out. Congratulations to the entire Flint team for achieving the 6.8 mpg goal. When the next challenge is announced, we will let everyone know. If we can gain another 2 ticks, I guarantee there will be something a little more substantial than hamburgers and hot-dogs on the menu. Our sister company in Flint (Penske Shuttle) has leased the building next door. This provides an opportunity for us to utilize some additional space to park tractors indoors when the mercury dips. We will also be installing new power strips along the west wall, which will accommodate even more units on weekends and holidays. The safety team is working on a tractor board that will provide the location of all our equipment at a glance. It will be located just outside the dispatch office, and will require driver participation. Please take advantage of this new process, and please maintain a semblance of order. The board is self-explanatory, and should facilitate the dispatch process. With all of the new equipment rotating in, please be courteous to your fellow drivers, leave it like you found it, clean and full of fuel. We have come a long way over the last year with many accomplishments to be proud of. PROTECT YOUR JOBS, SUPPORT YOUR UNION, and BUY AMERICAN! The summer is winding down, and the cool mornings remind us that fall is in the air. Along with fall comes the additional school bus traffic, and parents running their kids to school. Please pay special attention in the a.m. hours, and look out for the little ones as they begin the new school year. We hope everyone had a memorable Labor Day weekend, and spent plenty of quality time with loved ones, either at home, or out of town. This particular holiday has come to signify the end of summer, but stands for much more than that. This, first Monday in September holiday, is a creation of the labor movement. Labor Day is dedicated to the social and economic achievements of American workers. It constitutes a yearly national tribute to the contributions workers have made to the strength, prosperity, and wellbeing of our country. This is the every man's holiday, so be proud of our contributions. Everyone gets a piece of the success and vitality of this great country. Hats off to us the great American worker. Our fuel economy continues to improve thanks to the efforts of every driver. Initially, we experienced a huge upward trend in mpgs that dramatically moved the needle in a positive direction. Currently, the improvements are a little more subtle, but still trending in the right direction. This leveling off was not unexpected based on equipment specs, so let's just try to keep the needle moving one tick at a time. Remember our goal is 7.0. FYI, there is a small wager between locations. FMCSA scores continue to be a major concern for all carriers. We need to make every effort to maintain our high standards in regards to safe driving. Please understand that safe driving violations are easily observable by law enforcement, and are the main reason drivers are stopped to begin with. Roadside inspections generally follow any stop by law enforcement. These inspections are usually expanded to include maintenance, HOS, and driver fitness inspections which frequently increase identified defects along with CSA points. We have recently shown a 5% improvement in our maintenance scores, but still need improvement in the most controllable areas like seatbelts, etc. Our CCA metrics continue to improve, thanks to a great team effort. The daily load volumes are still increasing and the dynamic day-to-day load spikes seem to have equaled themselves out for the time being. Our on-time pick-ups are currently at 96%, deliveries at 94%. The goal has been 95% across the board and we're almost there. Safety cook-outs were enjoyed at both our Lansing and Flint terminals. The Lansing terminal had a pig roast and all of the fixings to accompany it. Thanks to all of the drivers for the hospitality and home cooking. Flint, not to be out done, had another great barbecue, along with an opportunity for drivers to showcase their skills in the form of a mini rodeo. All participants will receive a t-shirt for their efforts, and congratulations to the winner, Terrance Allen. Te will be receiving the embroidered jacket for low score. PROTECT YOUR JOBS, SUPPORT YOUR UNION, and BUY AMERICAN! We hope everyone is adjusting to the new HOS requirements, and incorporating the mandatory off duty rest break into their routes. In spite of much speculation about these changes being overturned, unfortunately this has not been the case. There has been one development involving the half hour break for short haul drivers. If you had to stay within a 100 mile radius of your home terminal and return at the end of the shift, the break will not be required (basically a switcher or shuttle). Any way you slice it, with a 24 hr. operation, and our length of haul, we see more utility in compliance. Take the time as off duty, and save the hours (2.5 per week), these changes are all now a Federal Law and subject to enforcement by the DOT. The soft enforcement of the new HOS requirement is quickly coming to an end, so please keep in mind that missing this one mandatory rest break could conceivably lead you into two more log violations in short order. Hats off to the Flint safety team, they took one proactive idea, a little hard work, and installed a nice fence, that's not only easy on the eyes, but could significantly reduce our ALGL, and workers' comp cost. With this one proactive idea, and some mutual cooperation, they have for all intents and purposes, taken the possibility of slip & falls right out of the equation. The 15th Annual Saginaw ACC Golf Scramble was held on Sunday, August 11 at Kimberly Oaks and was another successful outing. Congratulations to all the winners, and without a doubt we're certain that everyone is already looking forward to next year's event. The ACC family lost one of it's own, on July 29. Sadly, Chuck McAlevy passed away after a lengthy illness. Brother McAlevy was an extremely valuable employee here at the Fleet for over 10 years and will be deeply missed by all of us. Congratulations are in order for a bunch of our senior drivers, too many to mention by name, but you know who you are. Shout out to all the folks hired in 1998- you hit a milestone at 15 years' service and picked up another week of vacation to enjoy. Here's to 15 more productive years together. Also, Brother Richard Mallard has been selected to serve as the Chaplain of our local. I'm sure Brother Mallard will make an excellent Chaplain for the members of who may need some spiritual guidance. He is a senior employee of the Truck Fleet and valued member of Local 659. He has been an alternate committeeman, and safety team member. Congratulations on your appointment. Remember, Fort Wayne is hiring full time drivers, and I can't think of anything better than recommendations from our own people. Qualified drivers are in high demand in this area, and hard to find. Please keep in mind that if you recommend someone, and they are hired, and stay for at least a year, there's $500.00 in it for you. The summer is moving rapidly along. We hope everyone had a safe and memorable holiday with plenty of time to unwind, and relax with family & friends. The new federally mandated hours of service kicked in on July 1st. Understandably, this is going to create some HOS issues depending on shift. Hours worked between 1:00 am and 5:00 am present a challenge that relate to the 34-hour restart in 2 consecutive days. Weekend schedules and length of bid hours are all going to have an impact of some degree. We don't foresee any major changes to our scheduling other than the mandatory 1/2 hour off-duty break within an 8 hour period, and the possibility of less available hours on Saturday. Anytime we have changes to the hours of service rules, there is a learning curve, and it's understood that there will be 90 days of soft enforcement to ease the transition. Please keep in mind this is a federal law, so compliance is mandatory (there is no negotiating with the federal government). It's up to us to pay attention, obey the law, and remain safety compliant. The orders for quarterly awards have been placed. Congratulations to the folks who will be receiving the clothing, and it is our hope that everyone is eligible at the next entitlement. Our initial lean team tire project is paying off, and transitioning over to maintenance. In order to keep the process moving forward, we are relying on periodic spot checks, and proper pre/post trip inspections, as well as the new bi-annual trailer PM policy to help maintain the high standard. Fuel economy continues to improve, and the team would like to thank everyone for their efforts. The order has been placed for 18 new Volvo I shift tractors, with delivery expected sometime in early November. These new tractors are a direct result of the savings that are realized by controlling fuel consumption. Additionally, a deal has been reached with the manufacturer in regards to some of our high-maintenance, low-performing tractors. Thanks to Brian Mackowiak and some considerable arm twisting, we have 25 replacements forthcoming that should improve the bottom line. Please take advantage of the suggestion program, and keep the lines of communication open. Just about everything discussed up to this point has resulted from an associate suggestion, or the dialog it created. It's your business and no one knows it better. Future discussion items will include Grille guard business care, and compressed natural gas pros & cons. Give it some thought. PROTECT YOUR JOBS... SUPPORT YOUR UNION... BUY AMERICAN! Once again our service is second to none. During a recent carrier review, GM provided a chart, which illustrated the continuous improvement over the last 15 months at every plant we currently service. The customer also indicated that in reviews with other carriers, they are benchmarking our service against all the other carrier metrics, as an example of what is expected. With this kind of performance, we are well on our way to maintaining metrics that will help ensure our consideration for Carrier of the Year. Without the hard work and dedication of every team member, we wouldn't be where we are today. We continue to demonstrate very good performance in the area of safety, but still need to focus on quality pre/post trip inspections. Please, pay special attention to brakes and lights, these are two areas that have negatively impacted out vehicle maintenance scores. Additionally, seatbelt violations have a strong negative impact on safe driving performance, and are a major contributor to the deterioration of CSA scores. We always talk about the value of a quality CSA score, and the impact it has not only on the individual, but the Carrier. We now know for certain that CSA score is a new area of focus for the customer. We're the ones who brought this to their attention, so it's incumbent upon us to maintain our edge relative to the competition, and to further solidify our position as their primary transportation provider. We would like to thank everyone for the current upward trend in MPGs. Fuel remains our single largest cost bucket, and we have enjoyed significant improvement over the last 13 weeks. All of our lean projects, but primarily driver participation, has dramatically contributed to the positive trends. Not only is it good for us, but good for the environment (yes, the customer is now looking at carbon footprint) so be advised, that anything we can do to shine more light on the positive direction we're heading, we intend to grab, and run with for distance. Let's keep up the great work, and maintain the positive momentum. PROTECT YOU JOBS... PROTECT YOUR UNION... BUY AMERICAN!!! Once again, hats off for providing some outstanding customer service. Day in and day out our performance remains consistent at 99% or better. Let's just keep showing off! The "Lean Team" tire project has progressed, with the team systematically handling and inspecting around 2,000 tires. We've set the bar pretty high in terms of tread depth, unusual wear, and proper inflation. It has already been proven that proper tire maintenance not only increases fuel economy, but also dramatically increases tire life, and improves our safety scores. The team would thank everyone for their participation with the progressive shifting video. The whole purpose is to focus some attention on the ever-rising cost of diesel, and provide some insight into the tremendous volume of fuel a fleet of this size actually uses. To put it into perspective, we drive approximately 18 million miles per year. Based on our current mpg of 5.8. we use about 3 million gallons, which equates to roughly 6 Olympic-size swimming pools. If we can reduce fuel consumption by just 1/4 gallon per mile across the board, we can save in excess of 90,000 gallons. With a little effort, like using the cruise control whenever possible, shutting off the engine when parked, and operating within the manufacturers specified power bands, the savings accumulate in a big hurry. We have changed the ACC Safety Award & Incentive program for spring. The goal is 0 accidents and 0 injuries for 60 days starting Monday, April 15th to Friday, June 14, 2013. The "award pool" starts with 6 ACC/UAW embroidered wind breakers, and 114 screened T-shirts. See the postings at the individual work centers for details. The new hours of service regulations go into effect on July 1, 2013, (unless overturned). Two major components include two consecutive periods between 1 a.m. and 5 a.m. for a 34-hour restart. Also, drivers cannot drive beyond 8 hours, until they have taken a 30-minute break. It remains to be seen how these changes will affect the industry. PROTECT YOUR JOBS... SUPPORT YOUR UNION.... BUY AMERICAN! Finally old man winter is on his way out, we can expect the weather to dramatically improve over the next few weeks, and give us a break from the cold. We can also switch to the cheaper summer fuel blend and maybe save a few bucks along the way. Once again, our on time delivery continues to shine, it’s nearly 100% on the freight side, CCA, however, could stand some improvement. Please keep in mind, that the same rules apply as far as window times, and if you are delayed it needs to be communicated to dispatch to avoid our daily metrics sliding in the wrong direction. Our goal for CCA is 95% in order to be considered for some new work (15% increase) that will include LTL pick-ups and out of network long hauls within the state of Michigan. We are continuing our discussions about the impact of proper tire inflation. All of our data thus far suggests that there is a substantial savings to be gained with very little effort. One test run in particular has proved that proper inflation saved as much as 8 gallons per trip per day, talk about low hanging fruit. Tractor parameters are another story. We were fortunate to have a representative from Detroit Diesel come in to educate us about the numerous individual settings and their effect on fuel economy verses pulling power. Unfortunately, with some of the corporate policies, gear ratios, and warranty issues, we have put parameters on the back burner for the short term based on the level of complexity. Fuel is still our biggest challenge at all locations, it takes about a gallon of fuel to idle for an hour and about ¼ gallon to get back to speed after a stop, so anything we can do to cut fuel consumption helps. We drive millions of miles per month so it’s easy to see how big an impact this can have and how fast the dollars add up. The new suggestion boards should be installed and ready for use at all locations. Please take the time to see where they are located and feel free to submit your ideas, they will be looked at and evaluated for merit and posted for review. We have already had some driver suggestions implemented, and realized increased revenue immediately so keep the suggestions rolling in.